Every Friday night during the summer, you’ll find us firing up our charcoal grill and making homemade grilled pizzas. There’s nothing better! It’s become a summer tradition for my husband and me. It’s a great way to spend some quality time together while cooking up a fun, homemade meal! Last Thursday, my husband had plans to spend the day fishing. Knowing he’d be pretty beat when he came home, I made a crockpot London broil for dinner. I cooked it in a mixture of beef broth, fajita seasoning, and adobo sauce. 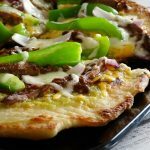 It shredded apart beautifully and was delicious as soft tacos! The leftovers were even better on pizza the next day! We love getting creative with our pizza toppings. 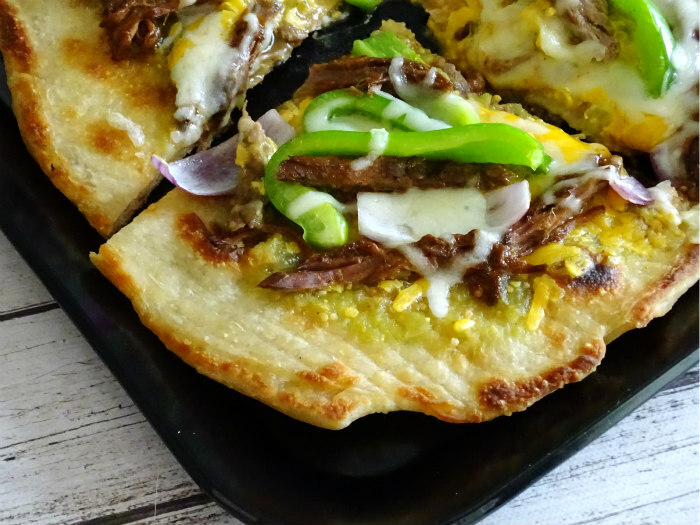 Since we had shredded beef left over from the night before, we decided to make Grilled Steak Fajita Pizza for dinner. 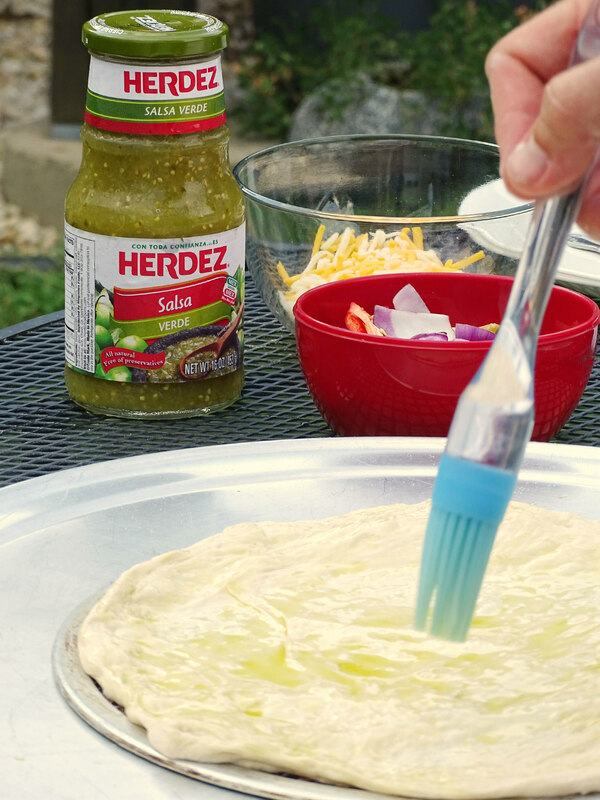 We swapped out tomato sauce for HERDEZ® Salsa Verde. Then, we added peppers and onions from our garden, some shredded beef, and topped it off with a mixture of shredded cheddar and mozzarella. It was awesome! Preheat your grill, on high, to 400º. Allow pizza dough to sit out at room temperature for 20 minutes prior to grilling. Add a little flour to a pizza pan and begin stretching each piece of dough into an 11-inch circle. Once dough is stretched, brush each side of the dough lightly with olive oil. Place dough on the grill and cook for 5 minutes. Take dough out, flip, and while working quickly, add toppings. Add salsa verde, then cheddar cheese. Top with pepper strips, onion, and shredded beef. Then, top with shredded mozzarella. Grill pizza for another 5 minutes, getting a nice char on the bottom. Cut pizza into four slices and serve with extra salsa verde. I am a huge fan of salsa and salsa verde is one of my favorites! Tomatillos give salsa verde its color and slightly sour bite. It’s a little thinner than regular salsa, but it’s so, so good! 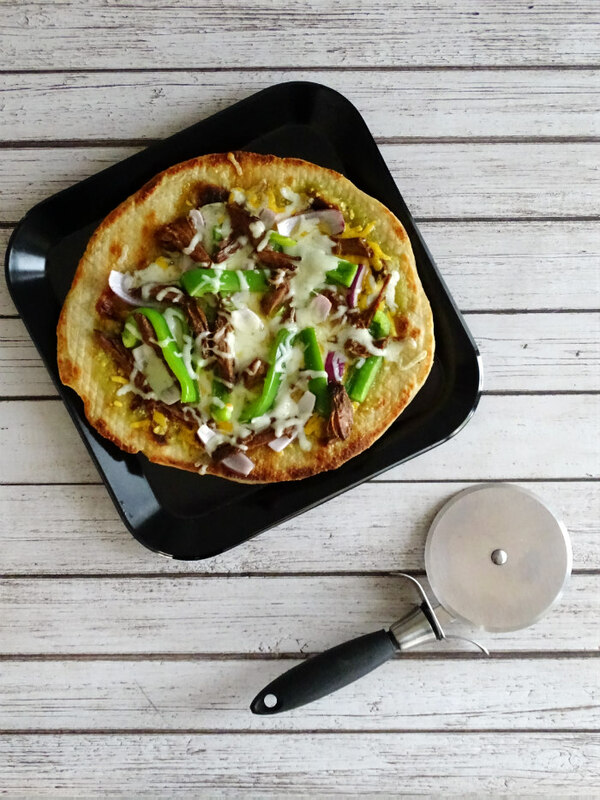 It worked perfectly on our new fajita-style pizza creation, giving it the right amount of freshness and perfect amount of mild salsa heat! During a recent trip to Walmart, I picked up a jar of HERDEZ® Salsa Verde. It’s a fresh & delicious salsa that goes well on foods from chips to…pizza! 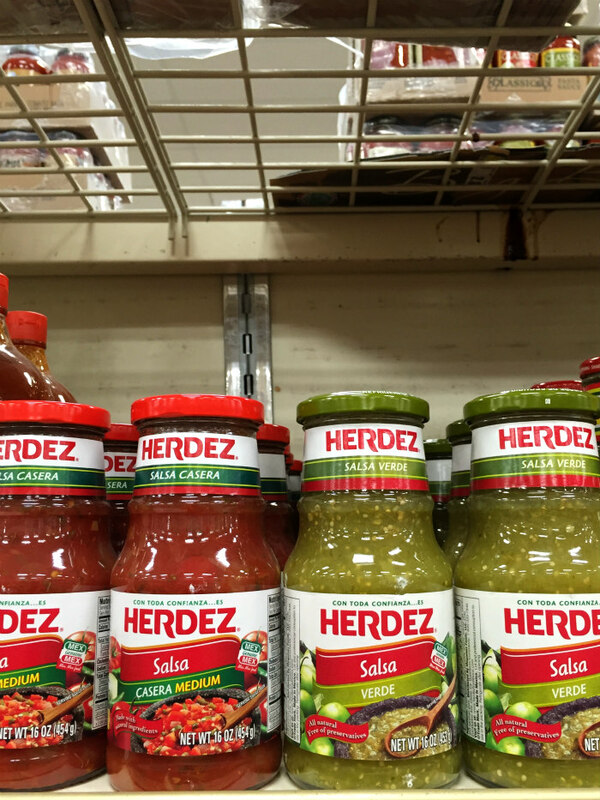 You can find HERDEZ® salsa products in the International aisle at Walmart. How do you take salsa to the next level in your recipes? thanks for linking up and sharing your delicious recipe with us at #overthemoon link party. Your pictures are magazine ready and this recipe is to good not to try! Grilled pizza works well on a gas grill, too! It’s how we started making them! 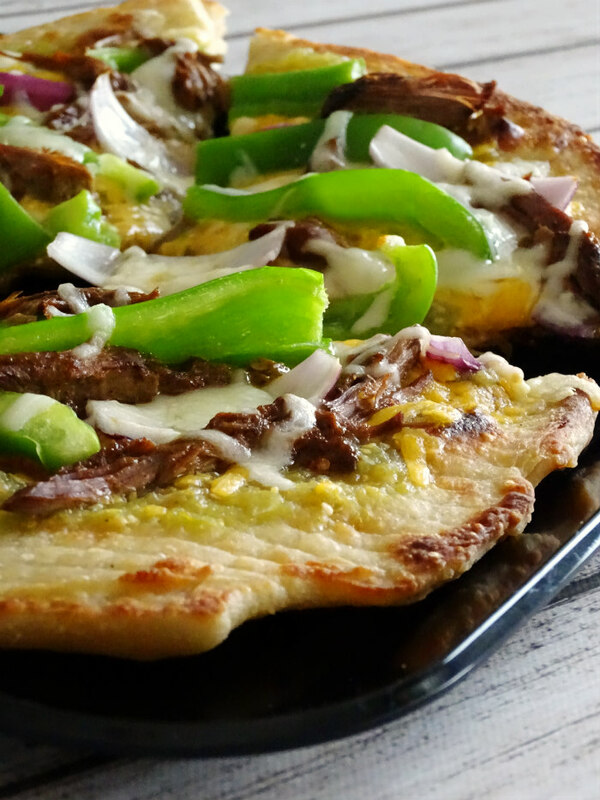 🙂 I hope you enjoy this fajita pizza recipe! I’m pinning this beauty!! Thanks for sharing at the What’s for Dinner party! I am making Pizza tonight I might just have to try this, it looks so good! Thanks so much for sharing with us at Full Plate Thursday,we are so happy to have you join us. Have a wonderful week and come back to see us real soon! We absolutely love that salsa!! My Mom introduced us to it several years ago and its our favorite. Your pizza looks so yummy too!! I am going to have to give it a try!! Thanks so much! I hope you enjoy this pizza! And I definitely agree – this salsa is great! 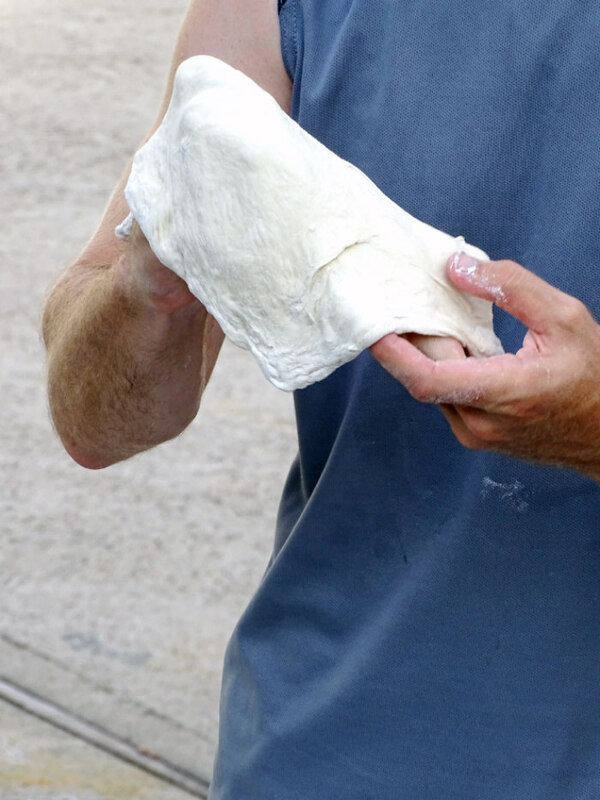 I have never grilled pizza dough on the BBQ…..do you use a special rack? Won’t the bread dip down through the spaces between a regular rack? If we’re using our charcoal grill, we have a pizza screen that we use. If we’re grilling pizza on the regular gas grill, we just put the pizza dough on the rack. The heat from the grill keeps the dough from seeping through the grates.